Cabbage Ginger Noodles | Naturally. Every time I’m sick, I reach for ginger. Ginger in smoothies, ginger in soups, and ginger in noodle bowls. These ginger noodles were whipped up in a frenzy while M was asleep on the couch and Mack was napping for 20 minutes. It is a similar broth to that of this Bok Choy Soup but pulls a extra flavor. I like Napa cabbage, it’s a bit sweeter in flavor and melts nicely into the noodle bowl without having to cook for a long time. In a stock pot, heat olive oil over medium-low heat. Trim the ends off the scallions and chop through the light green stem. Save the dark green tops for topping. Add the scallions to the pot with the garlic and ginger. Cook, stirring occasionally for 2 to 3 minutes until the garlic and ginger is fragrant. Add in the soy sauce and miso, stirring up any pieces of scallion stuck to the bottom. Measure in the vegetable broth and water. Bring to a boil, reduce to a simmer, and add in the ramen noodles. Cook for 4 minutes then add in the cabbage. Cook for another 4 to 5 minutes until the ramen and cabbage is tender. Stir in the sesame oil, remove from heat, and divide into 2 bowls. Serve with a sprinkle of sesame seeds, chili flakes (if desired), and scallions. Given this soup is usually just thrown together our of hunger/necessity, I’ll often use whatever I happen to have on hand at the time. Noodles, cabbage, and even some of the broth flavorings can be switched depending what you happen to have stocked. 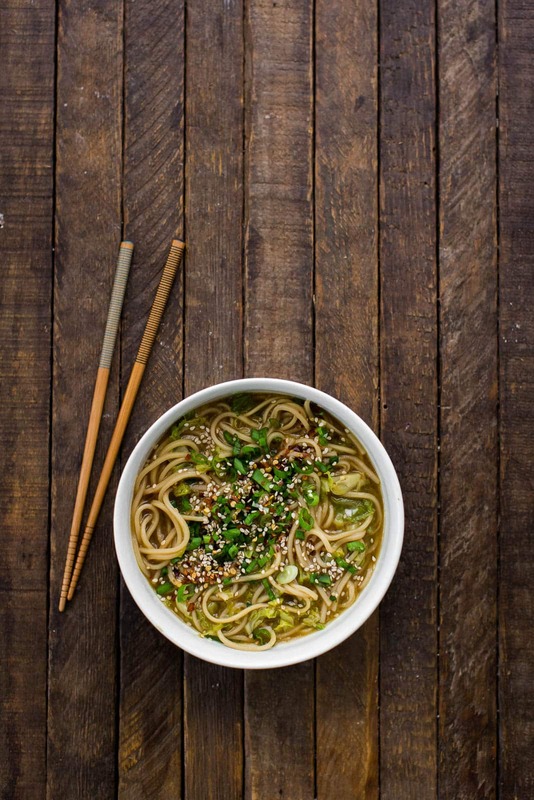 Noodles: Whenever I make a broth based noodle bowl, I reach for ramen. However, soba or udon noodles would also work. 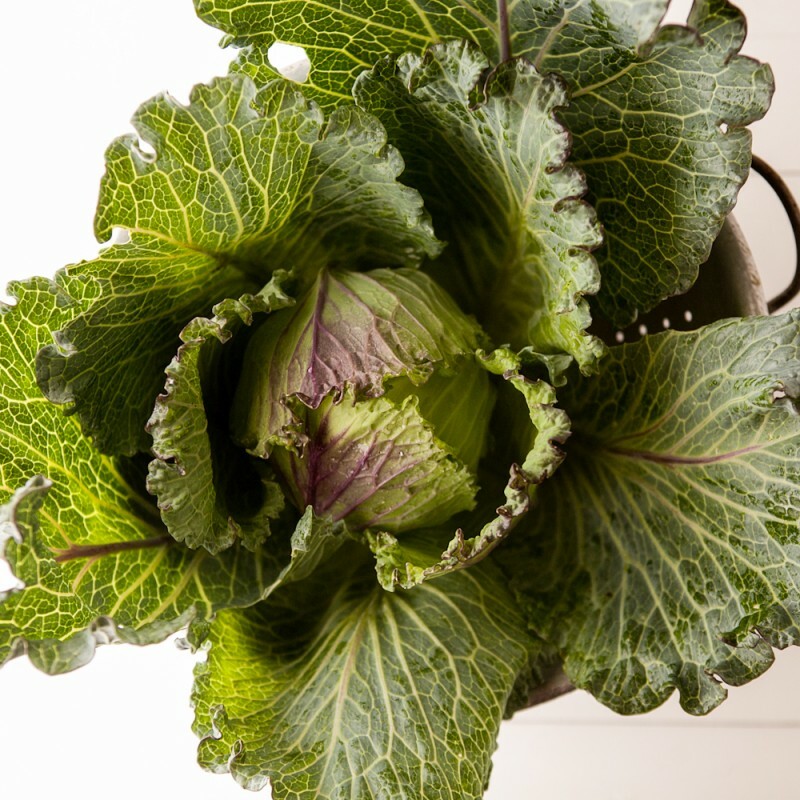 Greens: As mentioned above, the Napa cabbage works well with the ginger noodles but any type of cabbage can be used. Or try a few shredded Brussels Sprouts. 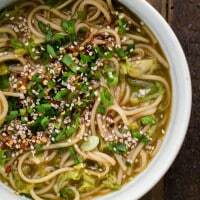 Gluten-Free: Look for gluten-free soba noodles or rice noodles would work as well. I seem to always forget about cabbage in the cooler months as there seems to be so many options for greens/brassicas. However, I encourage you to pick up a head at your local market or store. It’s perfect in soups, summer rolls, stir-fries, and even a quick-made coleslaw. This looks so warming and comforting. I always reach for ginger when I’m sick too! This looks so good. I’m the same way when sick…always have to have ginger. Love ginger tea especially. I have long been reading your blog but it’s the first time I dare to make one of your recipes . I have to say is delicious. Greetings from Spain! I made this for supper tonight – delicious!! I’ll be making this recipe again. Soooo much better than the instant ramen I ate years ago, and so easy. I especially liked the ‘burn’ from all the ginger. Delicious! I added some chopped celery, mandolined carrot and a chicken thigh (which I braised with the aromatics and then removed before adding the noodles and cabbage, chopped, and then added back with the cabbage). I only had dark soy sauce which made the broth quite dark, but the taste was perfect. I love won ton noodle soup, and this had most of what I love (although parcels of pork mince are pretty great). Really wonderful idea to skip the old noodle recipe and add some flavor to it.. Thanks for sharing.. I had a head of cabbage and was searching recipes and came across yours – my luck! I made the soup yesterday and added extra cabbage, miso, water and ginger; I also subbed Udon noodles for Ramen. One of the best soups I’ve ever made!! Thank you! Beautiful photo as well which caught my attention. Will follow you on Twitter! 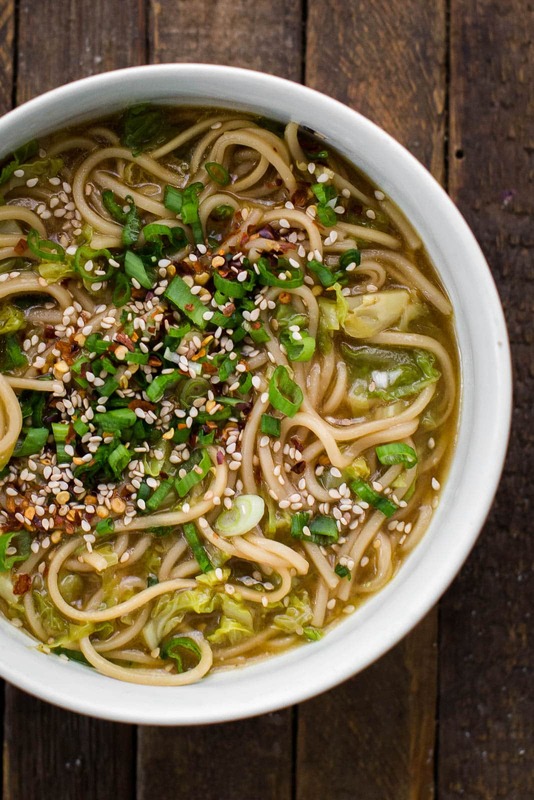 This is such a delicious take on noodle soup. Plus, simple! Gotta love that! I’m new to vooking Asian meals. When you say miso are you speaking of a miso paste or a dried miso soup packet? The miso can’t be in boiling water or it kills the probiotics and prebiotics in the miso. The flavor isn’t impacted much but this recipe says to add the miso and then boil the broth which negates the health benefits of miso. I’ve made this soup quite a few times now since I discovered it. I sub whatever noodles I have on hand (typically stir fry brown rice noodles) and it’s delicious every time. I’ve made this with both regular green cabbage and nappa; both are delicious. For a spicier soup, I like to throw in a spoonful of gochujang. Thanks for the wonderful recipe, I am sure I will continue to make this for quite some time!